For the interim of the Tour De France, I will be *except for the 1st day* spinning every day. Or at least that's my hope. Ravelry has a Tour de Fleece where spinners all spin and vote on their favorite yarn pictures each day! There's fabulous prizes which I will not win 'cause OMG some people make pretty yarn! Here's what I've got done so far. 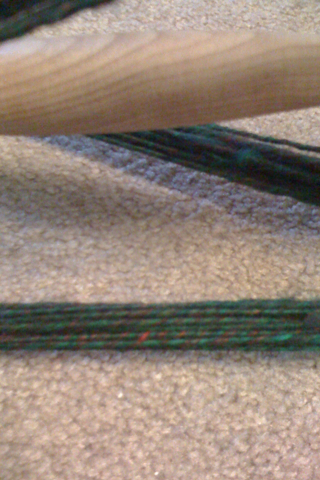 I'm hoping to spin enough so that my friend James can knit and felt a dice bag. Also, I'm renewing the Yarn Diet. With a twist. Anytime I make a purchase I have to eat either something I don't like, or something I've never tried before. I recently discovered a wonderful shop called Lush. I won't link there because I don't want you to fall into the evil trap that I did. But oh my... my face feels better and looks better than it has in years, and I smell awesome! However I am excited to be almost done with my 2nd sock of this pair. 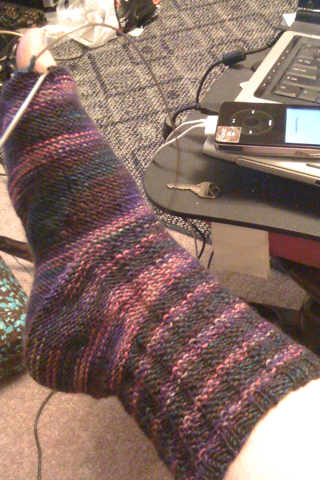 Knitting in magic loop definitely seems to be faster especially when you're not doing any pattern stuff. I think I'll do my next pair in plain stockinette using one of my self-patterning yarns. I'm always amused when someone at work sees me knitting and tells me I should sell socks on the side. "You'll make a killing" they say. I smile, and ask how much they would pay for a pair of hand knit socks. The answer is usually between $5 and $12. I smile again, tell them how much the yarn costs, and how long it takes me to knit them. That usually either shuts them up or they say "Oh.. so they're really only for you or people you REALLY like huh?" Little do the muggles know what "real" yarn costs! LOL Your socks are looking excellent and break a leg on the Tour de Fleece. I heard James talking about dice bags at your wedding and beforehand too. I'm sure he's anxiously waiting for the finished skein!